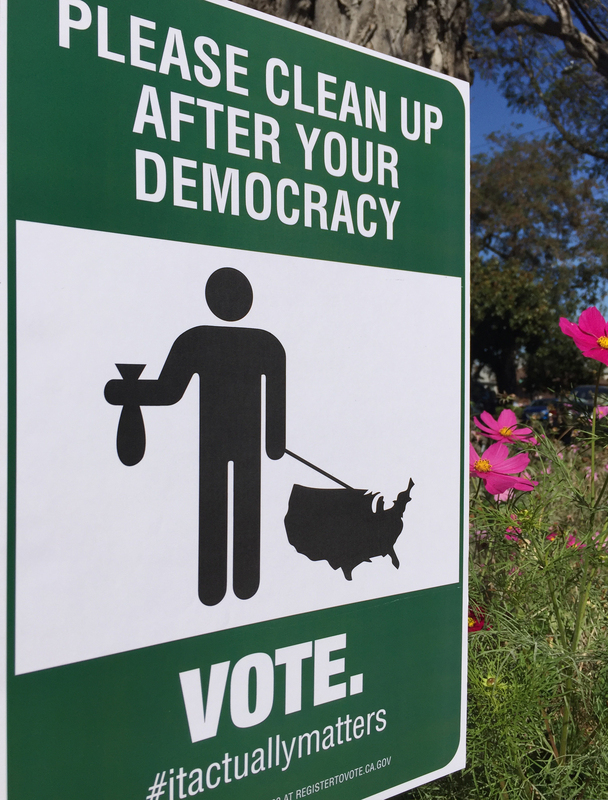 You pick up your mess – why should the neighbors sit home watching football while you rock the whole civic duty thing? Tell folks to get with the program with this chipper yet irony-laden “Vote” sign. Then revel in the knowledge that you’re not just right, you’re rightest. Feeling fancy? How about lazy? You can upload a Jpeg to Walgreens.com and get a mounted print on paperboard, cheap, for same-day pickup. Whoo hoo! And no, I don’t get kickbacks from Walgreens. I’m trying to spare you the heartache of trying to get stuff printed at ripoffs like Zazzle who charge $30 for a dinky little sign and jack up their “shipping fees” to $25 if you want it sooner than two weeks. the Walgreens link goes to a blank WordPress page…? WHAT?! *@$*!!!!!!!. Thanks for letting me know – fixed now! unfortunately, the walgreens link still not working. Good Lord. Okay so it’s REALLY fixed now. Honest. Thanks for letting me know!!!! Y’all are warming our weary hearts. Danke, grazie, arigato many times over.